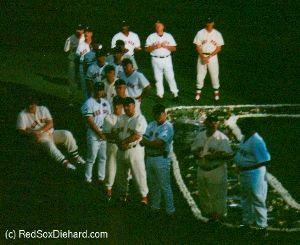 My next trip to Fenway was for the Ted Williams tribute celebration. 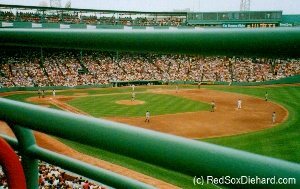 Fenway Park had been open to the public during the morning for fans to view Williams memorabilia, and I had a ticket to the evening event. It was a beautiful ceremony featuring former and current Red Sox players, as well as others who were touched by all aspects of his life, from his baseball career, to his military service, to his work with the Jimmy Fund. Read my full description and see my photos here. July 23 was Nomar Garciaparra's 29th birthday, and it was certainly a successful one for him. The Red Sox played a doubleheader against the Devil Rays, to make up for the rainout the day after Derek Lowe's no-hitter. I had traded in my rainout ticket for a game in September, but I had my usual Tuesday ticket for the night game. In the afternoon, Tim Wakefield started, and he gave up four runs over the first two innings. But the Red Sox scored 10 runs in the third, including two 2-run homers by birthday boy Nomar, and solo shots by Johnny Damon and Manny Ramirez. When Nomar came up in the third with the bases loaded, he hit his third homer of the day - a grand slam. (I was following the game online at work, and I let out a "Woo-hoo!" in my cubicle that was louder than I'd intended, because I heard someone who sits down the hall from me say, "Was that Kristen? Are the Red Sox winning?") Later Manny hit his second home run of the game, and Trot Nixon added one of his own. The Red Sox went on to win, 22-4. I went to the nightcap, which Derek Lowe was starting. A storm had come through after the first game, and it rained really hard my whole way in. I was worried about rain delays pushing the game past midnight and missing the T on the way back. I normally park at Riverside, on the end of the Green Line in Newton, but if the game went late and I had to take a cab back, it would be really expensive. I chose to park at Lechmere instead. It's at the other end of the Green Line so it's a little further drive, but it would be a much shorter cab ride if it came to that. There's also plenty of parking, and I wouldn't have to change trains to another line, because sometimes that can take forever late at night. It seemed like every game I had been to had a rain delay. The tarp was on the field when I got there, and the game didn't get started until the rain stopped at 9:15. In the meantime, the Yankees-Indians game was playing on the Jumbo-Tron. We watched happily as Cleveland jumped out to a 6-0 lead, and went on to win 9-3. When our game started, Lowe was excellent, and although the Sox bats were not as productive as they had been in the afternoon, they gave him a comfortable 4-0 lead. Everything was fine through seven innings. Lowe had only given up five hits, and it looked like the game would definitely be over before midnight. Apparently manager Grady Little had had a long day, because he took Lowe out after only seven innings and a mere 88 pitches. It didn't make a lot of sense to me at the time, even though it was a four run lead and "only" the Devil Rays, because with the doubleheader I thought the bullpen should be used as little as necessary. Chris Haney came in for the eighth and retired the side in order. But in the ninth, it all broke down. Haney started the inning with a single, a double, and a hit batsman, at which point he was replaced by Ugueth Urbina. 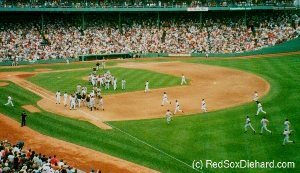 The bottom of the order was coming up, and it was particularly painful when ex-Sox scrub Andy Sheets hit a double off The Wall to score two runs. Rookie Jared Sandberg followed with a homer into the screen, and just like that, the Devil Rays led, 5-4. It was now close to midnight, but I wouldn't mind missing the T and taking a cab if it meant watching the Red Sox tie it up and go on to win. Rey Sanchez led off the bottom of the ninth with a rare walk. Brian Daubach pinch hit for Rickey Henderson and struck out. Johnny Damon popped out to third. That brought the birthday boy up with a chance to be a hero for the second time today. Nomar hit a single, bringing up Manny, who had hit two homers of his own in the first game and a 2-run single in the second game. But there was no magic left that night. Manny made the final out. It was 11:55, and I didn't even have time to record the out on my scorecard or stop in the restroom. I grabbed my things and ran across the bridge and down the hill to Kenmore Square just in time. The T attendants didn't even make anyone pay a token; they just pushed as many people as they could onto each train and got us on our way. Even though I called for tickets the first day they went on sale, the bleachers were sold out for this game by the time I got through. (When I got there, it was Coca-Cola family day, and the majority of the bleachers had been reserved for Coke employees and their families, who were all wearing red shirts.) So I took a roof box seat instead, and it was the first time I had ever watched a game from the roof at Fenway. Generally, I've not been impressed by seats in the upper decks of the other parks I've been to, but it was fun to see my park, where I've been coming for years and know almost every angle, from a new perspective. Because I was sitting on the end of the row next to an aisle, I had to look through the extra bar they have on the railings near the aisles. At least no one could stand up and block my view! It was interesting, though, to look down between innings and watch the grounds crew and the fans in Section 8. One thing I did like about sitting upstairs was that there were no lines at the concession stands or in the bathrooms. It was almost like they had set up just for me. Sunday's game was the second day of the Red Sox wives' annual food drive, which benefits the Greater Boston Food Bank. 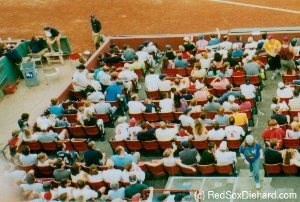 Fans had been asked to either bring five non-perishable items or donate $5, and they would receive an autographed picture of a Red Sox player. The ads on TV all week were very adamant that people wouldn't be able to choose which player they got a picture of, but when I got there, it was hard to even get close to the table to drop my cans off, because of all the people wanting Pedro or Nomar pictures. I said I didn't care who I got, and wound up with Lou Merloni, which suited me just fine. During the game, the totals for the two days were announced. They had collected 7,511 pounds of food and over $15,350 in cash. With two outs in the first inning, Baltimore right fielder Gary Matthews, Jr., reached on an infield single and tried to score on Tony Batista's double. But he missed home plate and was thrown out before he could get back. The Orioles argued the call to no avail. That out ended the inning, and got the Orioles in a bad mood. The Red Sox scored two quick runs in the bottom of the inning, and Derek Lowe started shutting the Orioles down. With two outs and no one on in the bottom of the third, Nomar Garciaparra doubled, leaving first base open. Baltimore starter Scott Erickson hit Manny Ramirez with the next pitch. It looked a lot like what teams who had trouble beating the Red Sox had been doing all year. If you know you can't get him out, walk him, but don't hit him! It seemed all too familiar, and didn't sit well with the Red Sox players (or the fans, for that matter.) The Red Sox made them pay. Jason Varitek knocked in one run with a double. Shea Hillenbrand's single and Melvin Mora's fielding error scored two more runs. 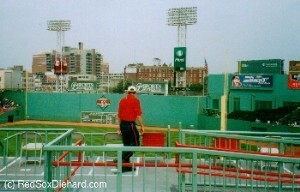 Brian Daubach was next, and he hit a home run just to the right of the yellow line on the Green Monster where The Wall meets the center field stands. The Orioles argued that it was off the wall and not a homer, but they didn't have any luck with that argument either. Carlos Baerga finally grounded out to end the inning with the Sox up, 7-0. Matthews led off the next inning, and Lowe hit him with the first pitch. Warnings were issued, and Matthews went down to first base. But after two pitches to Tony Batista, Matthews charged the mound from first base. The rest of the Red Sox ran in to protect their pitcher, and soon both benches emptied. It was funny to see guys charging in from both bullpens, but I was worried that Lowe, who was having a Cy Young-type season, would get injured. Baltimore reliever Willis Roberts wound up losing his shirt - Varitek ripped it off him after he had punched Baerga. Ugueth Urbina's shirt came untucked in the melee. Sox pitching coach Tony Cloninger held two Orioles in a headlock at home plate. When it finally ended, Roberts and Cloninger were ejected. Erickson and Matthews, who had started the whole incident, were not. Luckily, neither was Lowe. Lowe came out after six innings, which really upset me since I had just watched them lose after taking him out too early for no reason in his last start. This time, however, there was no cause for concern, because the game continued the way it had started. The Sox added three more runs in the fifth, and Doug Mirabelli hit a two-run homer in the seventh. The Orioles scored three off Tim Wakefield, but it was too little too late. The Sox had won a wild one.